For one moment, in the chaos, could you have a second of two of total control and comfort, where you owned yourself, your product, your expression? When I started working at the sushi restaurant a few years ago I had a spot in front of customers right next to the head chef. As orders would come in, I'd take a dinner ticket and work on it as quickly as I could. This cutting board was about three feet wide and about a foot and half deep so presumably there would be lots of space. As dinner service progressed I found myself making mistakes, not being able to find things even though I knew where I had placed portions of people's dinners. The master chef would always pull me aside and tell me to keep my cutting board clean. He wanted me to wipe off the board completely in between each order so there was nothing but the board, your knife, and your hands. 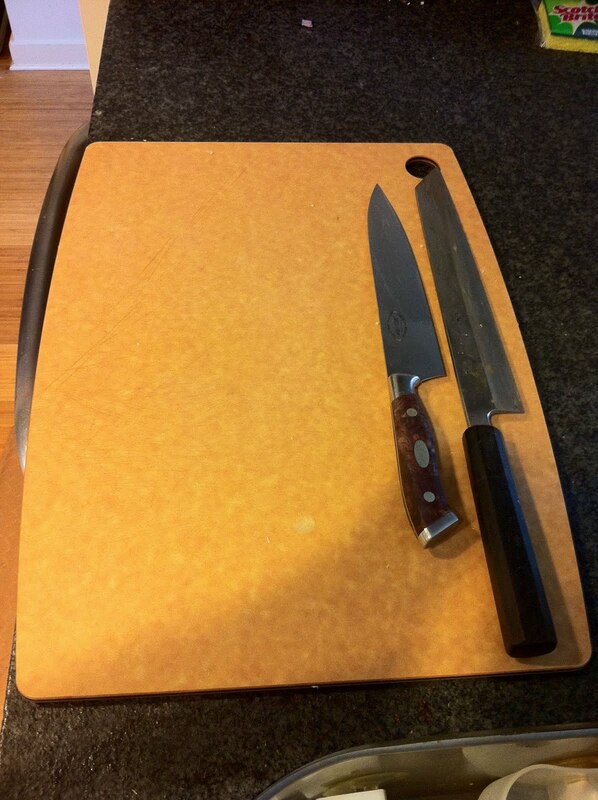 Being someone who likes to work on many things at one, I thought that it made sense to keep certain items ready on my cutting board, hoping they'd be used as part of service. I relented and started making a habit of immediately wiping down the cutting board quickly after each plate had passed. I think I just trusted in the judgement of the head chef. Presumably after a few thousand repetitions, I didn't think about it anymore and just did it. What did I realize? My pace didn't slow down. My pace of cooking improved. I didn't understand why. I figured that if I had ingredients ready on the board as opposed to on the side of the board, I'd be able to grab them quickly. I did a little research and talked to a few folks. Someone told me, that your cutting board is a representation of your mind. Your mind needs to be kept clear and ready to execute. But I was ready to execute. I could have all my materials on the board ready to go. Theres a subtle difference between having prepared materials on your board, and at hands reach nearby. The cutting board is an outline. If you see items within the outline, they clue you into what you need to make of them. What if I had items from other dishes in this outline, this box? They would tell me that they belonged in the dinner plate when they didn't. As I quickly looked at the contents of the cutting board, I'd have to discern which ingredient belonged in the dish and they would tell me wrong things. I thought about how I pulled ingredients from the refrigerated glass case and from my box of prepared vegetables and put them down on the board. Then when I began assembling, the ingredients would remind me where they went and I could focus on perfect placement. As I plated the dish and sent it out, I'd wipe the board down clean, and symbolically told myself that I was ready for the next dish. The time I had saved because I didn't have to cut through the confusion of rogue ingredients, translated itself into faster plating and execution. While this sounds exacting and unfeeling, this also allowed me to have enough mental runway to take a few moments and express myself creatively on the dish with final plating. The customers out in the front would be ordering items, the waitstaff feverishly sending out your creations, someone in the back kitchen might have dropped something, but for a moment, you owned yourself, your work and it's a feeling you could duplicate every single time. Treating every dish as if it were your last. I know much of this blog is a clearinghouse for your mindset—but this entry really resonated with me.